The traditional humidifiers display the volume of water by observing window or dial display. I translated this function into the flower blooming and fading. When the humidifier is lack of water, the digital flower fades. 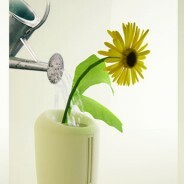 By watering the withered ‘flower’, the user is actually adding water to the humidifier, which fulfills emotional needs for the users.